An organized crime war breaks out between two rival gangs in Chicago during the Roaring Twenties. The leader of the Southside Mob is the notorious Al Capone, who resents his nemesis George "Bugs" Moran's activity in the city. Moran, too, wants control of the town's bootlegging and gambling operations. His lieutenants Peter and Frank Gusenberg use threats and intimidation to make tavern owners do business with them in exchange for "protection." Peter Gusenberg also argues and fights with his moll, particularly over her extravagant spending of his money. Moran gives the order to have a crony of Capone's eliminated as the Chicago body count escalates. Inclusive are flashbacks to a lunchtime attack on Capone at the Hawthorne restaurant outside of Chicago by Hymie Weiss and Moran in September 1926 and the murders of Dean O'Banion in November 1924 and Weiss in October 1926 by Capone's gang. In a bid to get rid of Moran once and for all, Capone goes to his winter home in Miami, Florida to establish an alibi while his henchmen, some dressed as police officers, ambush and execute seven members of Moran's gang, including Peter Gusenberg, in a northside garage on February 14, 1929. Also at the garage - and caught in the attack - were Johnny May (Bruce Dern), a mechanic, and Reinhardt Schwimmer, an optician who enjoyed being around gangsters. Of the victims, only Frank Gusenberg, Peter's brother survives and is taken to a hospital. Despite knowing that he will soon die, Frank refuses to tell the police anything. Moran, the apparent focus of the attack, was not in the garage, left for a diner, and escaped certain death. Each character is given a verbal voiceover biography as they are introduced, and in some video releases, the biographies of Rheinhard Schwimmer and Adam Heyer, two of the massacre victims, are removed from the soundtrack, possibly due to protest from surviving family members. In the aftermath, Al Capone is shown dispatching two of those responsible for carrying out the attack as he learns of their plans to kill him. Moran dies in prison, dropping a verbal clue to the crime: "Only Capone kills like that." No one is ever charged for the murders of St. Valentine's Day of 1929, as they either disappear going into hiding or are violently killed. The St. Valentine's Day Massacre was not, as might be guessed, inspired by the 1959-63 ABC TV series, The Untouchables, but is one of many motion pictures adapted from a CBS Playhouse 90 episode; Seven Against The Wall, broadcast on Playhouse 90 in December 1958, was also written by Harold Browne and featured actors Milton Frome, Celia Lovsky and Frank Silvera in the same roles that they play in the film. To make certain the film would have the look of a gangster film, Roger Corman shot the film at the Desilu studios and used other sections of the back lot for different locales of Chicago. He filmed the Massacre scene in one of the Desilu lots which got converted to look like the garage where the crime was committed. (The real garage was torn down by the time the movie started production). Another matter was the recreation of the Massacre itself: before filming, Corman found photos of the mass murders. Then he had the actors for the scene study the stills, followed by rehearsals and the shoot. After one take, the massacre came in the way it looked in the old photos and the collapse of each actors followed the positions the murder victims fell in the real massacre. The film was one of the few that Roger Corman directed from a major Hollywood studio with a generous budget and an open-ended schedule. While most directors would love such an assignment, Corman was disgusted with the incredible waste of time and money involved with "typical" movie production techniques. He was given a $2.5 million budget and made it for $400,000 less. Corman, an independent director, was most comfortable in his own style: shoestring budgets, and shooting schedules measured in days, rather than weeks. Nonetheless, it is generally considered one of his best films as a director. According to Fox records, the film needed to earn $4,550,000 in rentals to break even and made $4,165,000, meaning it made a loss. In 2009 Empire magazine named it #7 in a poll of the "20 Greatest Gangster Movies You've (Probably) Never Seen." The famous cafe shootout in this film, was used again in the 1975 movie Capone with Ben Gazzara as Al Capone and Sylvester Stallone as Frank Nitti. 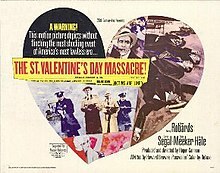 The St. Valentine's Day Massacre was released to DVD by 20th Century Fox Home Entertainment on May 23, 2006 as a Region 1 widescreen DVD. It was later issued as a Limited Edition Region Free Blu-Ray by Twilight Time.